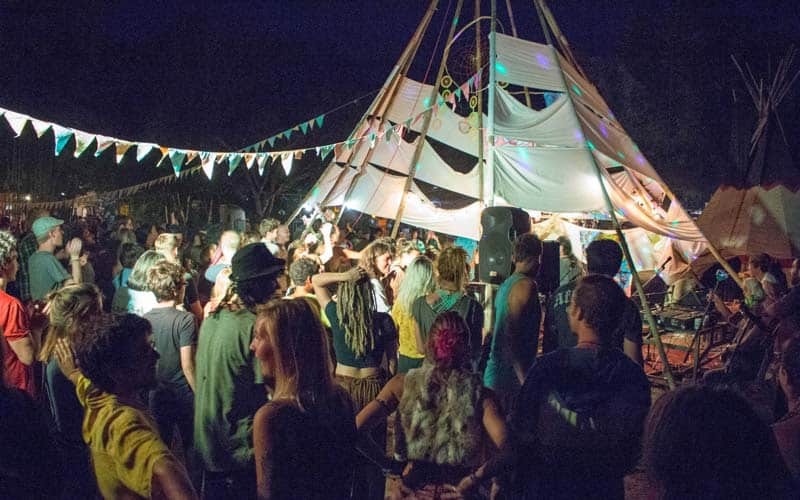 Chiang Dao Shambhala Music Festival is an amazing week! 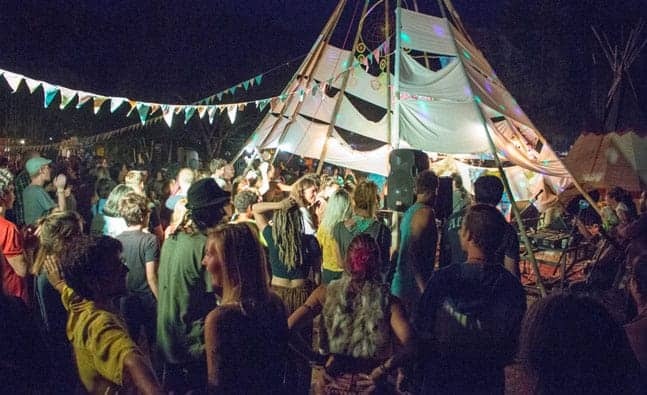 When I was first told about the Chiang Dao Shambhala music festival, I didn’t know what to expect. 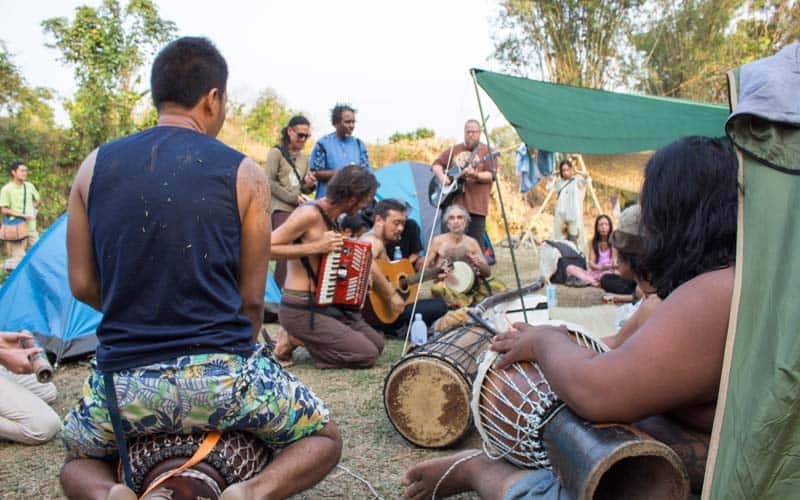 My friend said something about Japanese people hosting a Hippie Music Festival in the middle of a forest because it is on sacred grounds, I was a little curious. I mean why not right? I’m in Chiang Mai, the perfect opportunity to escape the city for the weekend and listen to some music as well as have an epic motorbike ride too. I was sold. So we packed a day pack, hired some bikes and went for our mission! 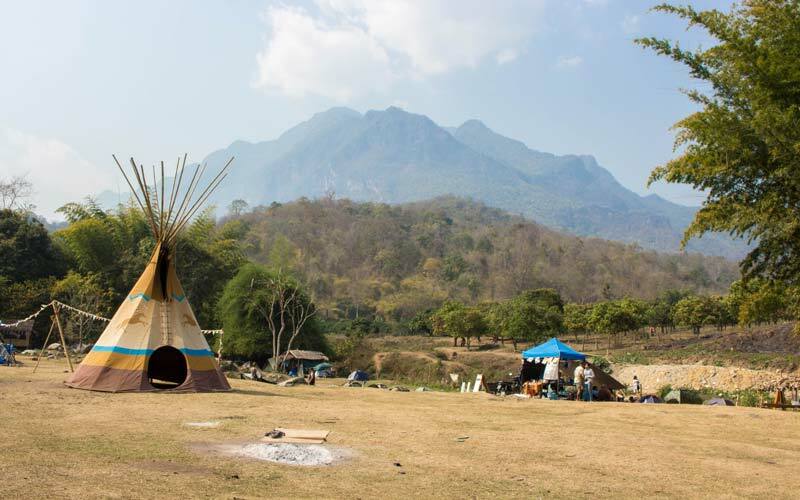 Chiang Dao Shambhala music festival is held every year from 15th-20th of February at this location, you can bring your own tent and that is included with entry fee or stay in surrounding farm stays, homestays and hostels. 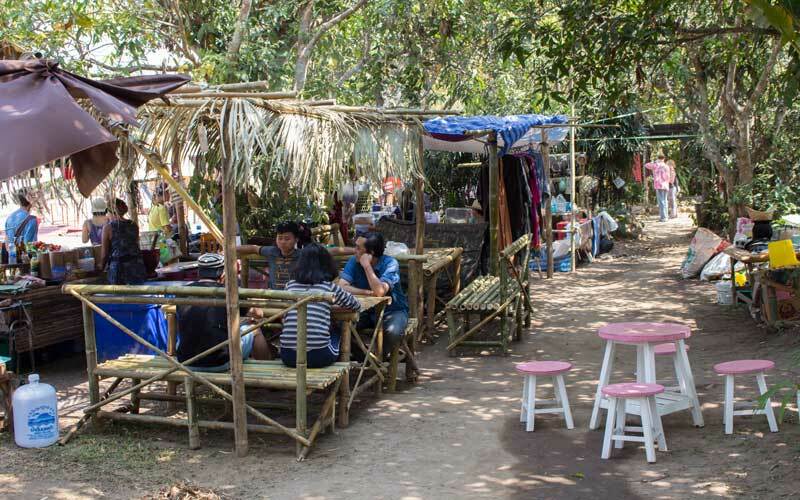 Entry costs 200baht per day for foreigners and 100baht for locals. It only took 10 minutes on our motorbike ride before we hit a police checkpoint, the other 2 bikes I was cruising with got waved down but luckily they were already full so I kept on riding. Little note for those hiring motorbikes anywhere in Thailand, make sure you have an international drivers permit or you’ll get fined 500 baht. Anyway once they payed the money, we were off again and the drive was literally epic. After about 30 minutes when you leave the city limits, it becomes a beautiful curvy mountain road and you head through a nice little gorge, it’s perfect! The traffic is very light too so it was very safe on the road. 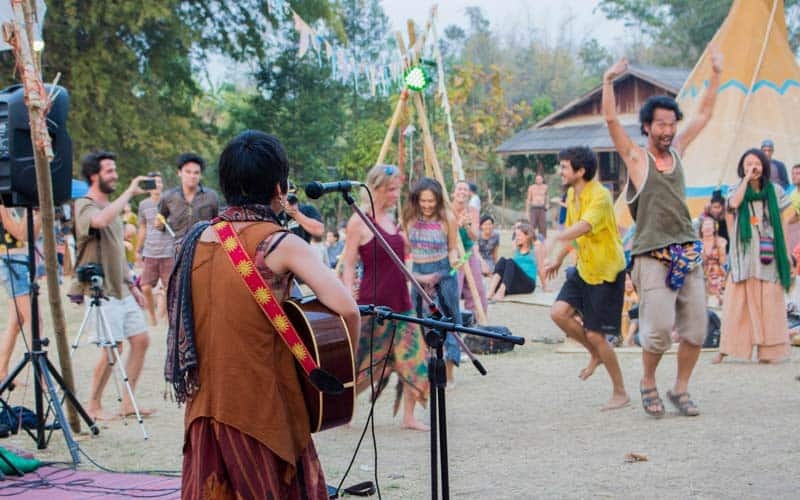 After about an hour and a half on the road, we finally got to the Chiang Dao Shambhala Music Festival. It was only early, around 2:00pm so everyone was just walking around, sampling all the amazing food stands and just soaking in the Sun, although it was smokey season. 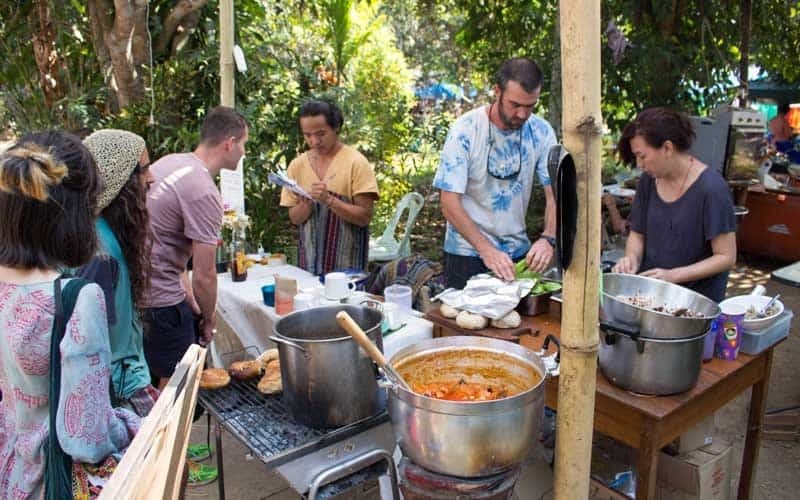 One thing I loved about Shambhala is that it wasn’t just Japanese people, it was also full of Thai people and foreigners from all parts of the world. The best part was the vibe from everyone, you would literally just be walking and see someone looking at you, you would look back and they would just smile and wave. It was a little confusing at first but that’s just the way Shambhala is! 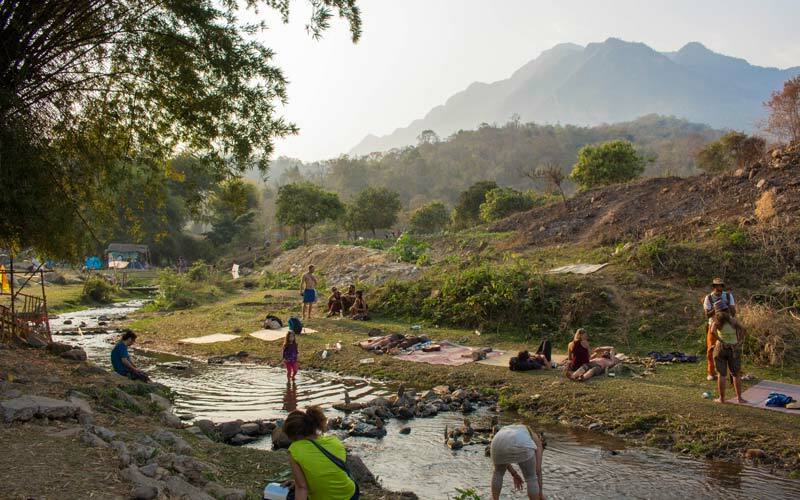 The landscape around the festival was incredible too, a fresh water stream came through the back part of the grounds next to the camping section and people got the chance to just chill in there during the hours of burning heat. Not only that but the mountains in the back were just amazing. 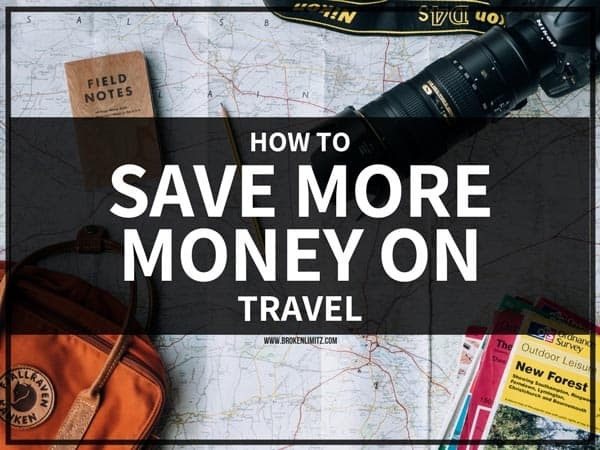 It is a shame that it is burning season as the surrounding mountains are breathtaking, but what can ya do! One of the highlights for me was the natural hot springs! 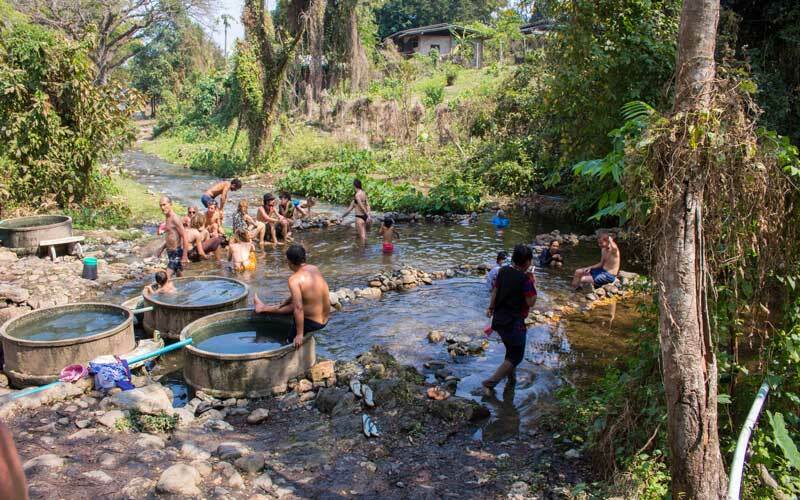 Just a 5 minute walk down the road from the festival and a little bit off the road is a some thermo springs (sulphur) that run through the PVC pipes and fill up concrete culvert baths. It is steaming hot and is really good for your skin apparently so I had a good 10 minutes in one before I was overheating and then jumped in the very cooling stream right below it. By the time we got back, some of the music acts had started. Some nice relaxing Japanese and Korean songs were being played which was very relaxing while sitting on the matts. The most amazing part though is the Jamming music. 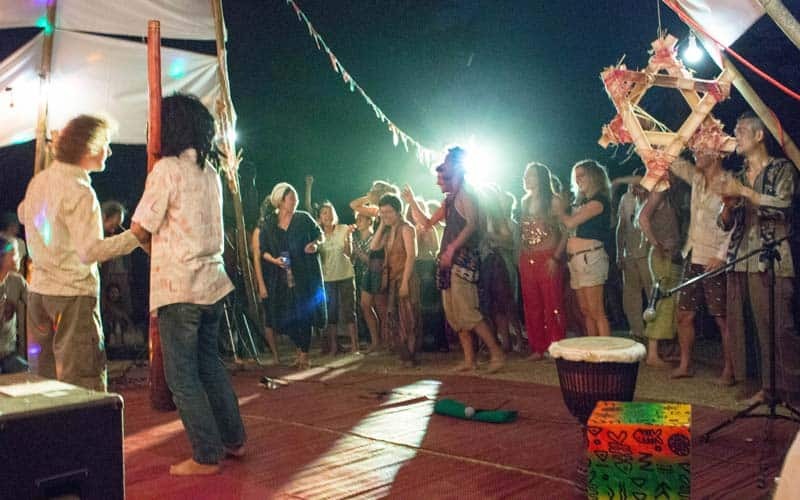 Ask anyone who’s attended a Chiang Dao Shambhala music festival what their best part is, and I bet they’ll say the same thing. A few people just start jamming around the tents and more and more people keep coming and adding to it. Next thing you know you have a 10 person band just jamming fresh music. It is incredible! As the sun starts going down, the music starts turning up. 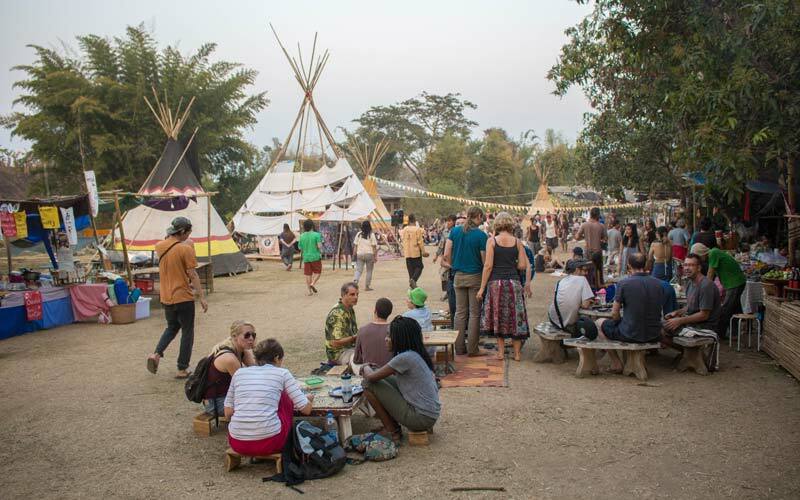 With it being a Hippie type festival, out comes a bit of the local grow and beers too and people start becoming more lively. Next thing you know, it’s 8pm and the festival is in full swing. 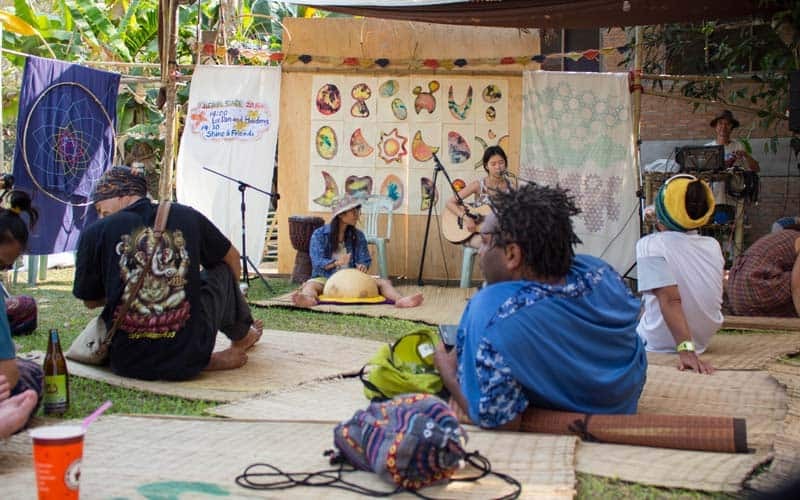 There are so many different acts from reggae music to traditional Japanese music to dance groups. It is a great night to be had. It is said that Shambhala started only 2 years ago with 300 people and has now grown to over 2,000 people this year. No doubt with such a great atmosphere like this, it will continue to grow too. I had a blast at Shambhala, ate some amazing food, met amazing people and danced the night away to great music. 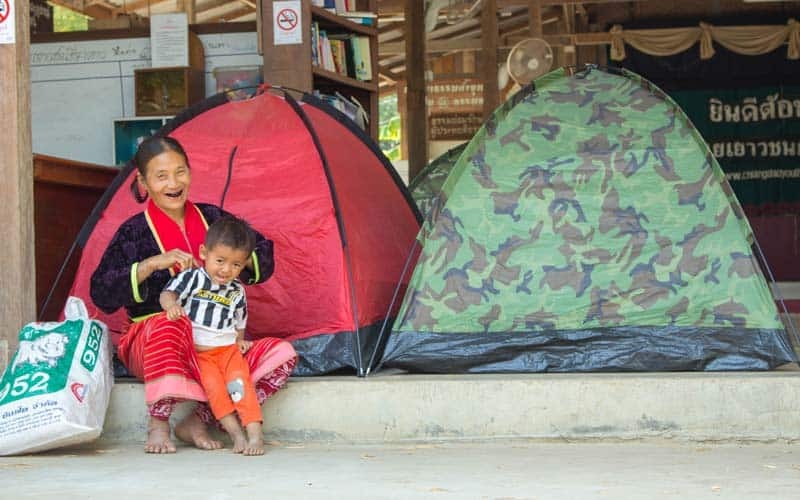 If you’re ever around Chiang Dao on February the 15th – 20th, be sure to stop in.